In Iran, Canadian/Iranian blogger Hossein Derakhshan has been sentenced to 19.5 years in jail for his unsanctioned writings about the state of Iran. It’s a sad day for him, of course, but also for the Iranian people, who, governed by a grotesque set of fascist thugs masquerading as representatives of God, are no more free than Derakhshan is. God willing, their sentences will be commuted and the mullahs’ reign of terror ended. Pray for Iran. The people there deserve freedom, liberty, and individual rights every bit as much as you and I do. President Obama has been in office for nearly a year now and one of the most pressing issues in the realm of national security still seems to escape him, namely what to do with Iran. The Washington Post, no right-wing, war-mongering rag, says that Iran may very well be at the tipping point. That means it’s time for the POTUS to take make his unilateral support for dissidents in that country known to the world. The problem is that it’s unclear that such support exists in the White House. Fear of a 21st-century Bay of Pigs-like episode may limit Mr. Obama’s actions and justifiably so. With the American military stretched like a taut wire, few resources exist to provide actual support for Iranian reformists on the ground. The Taliban in Afghanistan demonstrate another unfortunate reality: Guns and training that we give today’s resistance fighters can easily be used against our interests tomorrow. Nevertheless it is clear that the Obama administration’s policy of engagement with Iran was doomed to failure from the moment it was conceived. Negotiation can only take place between two parties with compatible value systems who have something the other wants. Unfortunately, the west has nothing that the theocracy in Iran desires. 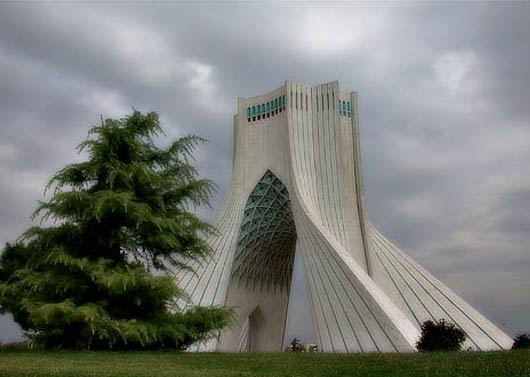 Conversely, the Iranian people seem to have a great deal of interest in opening their country to western influences like education and individual liberty, the very things that dictators like Khamenei must stifle due in order to maintain control over their citizens. What Mr. Obama must eventually come to understand that this outcome is not possible without regime change. No amount of diplomacy, threats, sanctions, or bribes result in anything beyond the ayatollahs’ amusement at stringing America along while they continue their thuggery at home and abroad. The simple fact is that the freedom fighters in Iran deserve support from the United States and the rest of the free world because their cause is just and their success in overthrowing the mullahs could make the world a significantly better place. The very least the Obama administration could do is make our moral support for their struggle clear and unequivocal while simultaneously putting an end to the international farce that has been our negotiations with Iran’s terrorist dictators. Finally, if there is any resolve in the administration to mount covert operations, now would be the time. Iran’s Protests Ending After Clerics Calls for Executions? 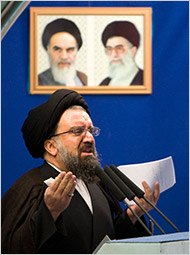 The New York Times thinks so after Ahmad Khatami, a senior Iranian cleric, called for the execution of protesters and the Guardian Council stated that the elections in held in that country were “healthy”. The direct confrontation over Iran’s presidential election was effectively silenced Friday when the main opposition leader said he would seek permits for any future protests, an influential cleric suggested that leaders of the demonstrations could be executed, and the council responsible for validating the election repeated its declaration that there were no major irregularities. This despite the fact that massive fraud was previously acknowledged in 50 cities across the country, leading many to wonder how much in the way of voting irregularity went unremarked by the regime. You have to wonder how long protesters can keep up their spirits and efforts while being hunted and beaten on a regular basis. 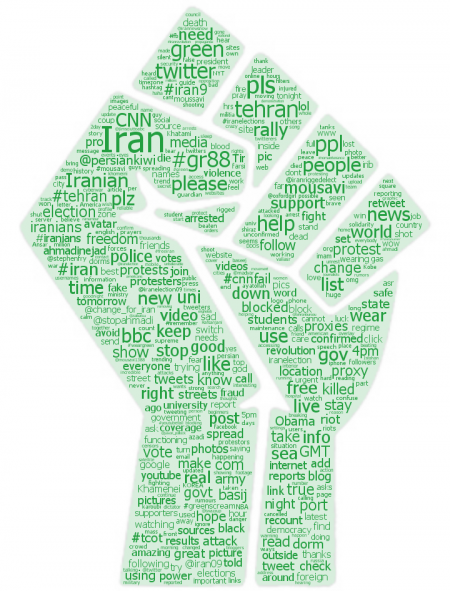 Unfortunately it now seems that the Iranian rebellion popularized on Twitter may end as such rebellions typically do, with the brutal power of the state crushing the hearts and skulls of unarmed citizens, thereby ensuring more years of oppression for people who only want to live their lives as they see fit. Sadly, the President of the United States, one Barack Obama, has been on the wrong side of this issue from the beginning. First he failed to recognize the vote fraud that will perpetuate Ahmadinejad’s rule in Iran. Then he failed to give even the pittance of verbal support for those protesting in favor of free and fair elections. Finally Mr. Obama was forced to acknowledge these things when the Iranian state inevitably became violent, only to have the protests begin to fade away as pressure from the mullahs forced the people to fall silent. Who knows what might have happened had Mr. Obama simply responded honestly and openly to the facts on the ground instead of playing a cagey, strategic game with the protestor’s lives? There are those who claim that this was the right thing to do, that the strategic advantages achieved by doing nothing outweigh the obligation that America has to support those who would bring change to Iran and the Middle East, and that our passive reaction to a once-in-a-generation opportunity in Iran will bestow favor on America in the eyes of the mullahs who run Iran. Shame on them for their lack of vision and courage. So little was asked of the Obama administration – simply telling the truth was all that was required. Now it appears that their lack of conviction has cost us this chance for change, along with the lives of many Iranians who will go into their graves unknown and unsupported despite having embodied everything the United States purports to value. 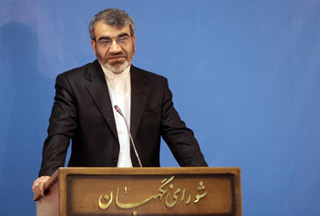 “Statistics provided by Mohsen Rezaei in which he claims more than 100% of those eligible have cast their ballot in 170 cities are not accurate — the incident has happened in only 50 cities,” [Iran’s Guardian Council’s Spokesman Abbas-Ali] Kadkhodaei said. Are young Iranians supposed to be comforted by that? A little amateur statistics, then. Let’s say that in City X that 110% of the voters voted, somehow, and 63% of these went for Ahmadinejad and 34% for Mousavi, as reported by the regime. Let’s also say that 110,000 votes were cast, using round numbers to make the rest of the analysis easier. Now, the big leap. I presume that the ballot box stuffing was done in favor of Ahmadinejad. This isn’t too much of an assumption; nevertheless, it is an assumption and you know what happens when you assume. Ahmadinejad still wins, carrying the city by a narrow margin, the race close enough, perhaps, to raise the specter of fear and defeat in the hearts of Iran’s ruling mullahs. Enough fear to make them cheat? Unknown. But the possibility exists and events that have transpired since have done nothing to diminish the probability that the Khameini regime tried to rig the vote. Roger Cohen’s report from Tehran is a must-read. I hate to chop it up here, but there are some points I want to make. That’s so awesome. A man saying the same words would not inspire another man the same way. Iranian women have so much to gain from a free society; it’s not hard to see why they are so motivated after 30 years of repression. The United Nation is a joke, a bad joke that gives thugs and dictators like Khameini and Chavez equality with the President of the United States or the Prime Minister of England. The U.N. is a place where grievances are aired; no real crisis can ever be resolved there if it requires any sort of conflict or commitment. A better question would have been, “Can the United States help us?” Sadly, the answer would still be “No”. But if any formal outside assistance could be generated, it would come from the U.S.
Not so much, obviously. There is never freedom in state-mandated beliefs and behaviors. Legality necessarily constrains freedom and religious legalism as much or more so than any other form. Iran’s state religion has brought the world multiple forms of terrorism and its own people unthinkable levels of oppression. None of this, it must be said, is in God’s plan for people. Somewhere in his heart, even the Ayatollah must recognize that elementary truth. The U.S. House of Representatives, not put off by President Obama’s peculiar reticence to embrace the millions of Iranians desperate to have the kind of freedom first fought and died for in America, just voted overwhelmingly to pass a resolution in support of those protesting in favor of free elections in that country. “This resolution is not about American interests,” said Rep. Howard Berman (D-Calif.), chairman of the House Foreign Relations Committee. “It is about American values that I believe are universal. In a small way, this vote makes me proud of our Congress and to be an American. Despite our many blunders, there are many times when we get it right, as in this case. Charles Krauthammer’s latest re the standoff in Iran is an absolute must-read. Those who advise President Obama to equivocate now, at a crucial moment in history, must believe – mistakenly – that there can be a meaningful dialogue with the current government in Tehran on the subject of nuclear weapons and terrorism. But as Krauthammer says, the hope that non-confrontationalist appeasement will ever wring any important compromises from the pitiless regime that rules Iran is a chimera. Even from the narrow perspective of the nuclear issue, the administration’s geopolitical calculus is absurd. There is zero chance that any such talks will denuclearize Iran. 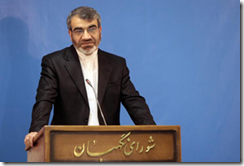 On Monday, President Ahmadinejad declared yet again that the nuclear “file is shut, forever.” The only hope for a resolution of the nuclear question is regime change, which (if the successor regime were as moderate as pre-Khomeini Iran) might either stop the program, or make it manageable and nonthreatening. For those who like to think strategically, realize there is no upside to remaining silent, only the prospect of dealing with an implacable, immovable enemy from an even greater position of weakness. Conversely, the downside, that an Iran free of the mullahs’ oppression and terrorism never comes into being, is immense. after just excusing a Black Panther for intimidating white voters with a nightstick, he doesn’t want to look like a hypocrite just because a few Iranian voters get beaten. Or worse. Very succinct and very apt, methinks. This right to dissolve the state, as Jefferson well knew, is foremost in men’s relationship with the government. Elections are meaningless without that final, terminal authority, for what does a vote matter if it can be disregarded or canceled out by stuffing that ballot box? A government’s rejection of the verdict of its people is its worst possible offense, far worse than mere corruption or incompetence, because such a refusal to bow to its citizens’ authority in an explicit rejection of every single man and woman’s right of self-determination. This is why so many of the Iranian people are still in the streets, despite the arrests, beatings, and killings that are taking place among them, because the government in power now has actively defrauded them in order to retain that power. Understand that I realize the demographics in Iran are not as clear-cut as the massive protest makes them seem. 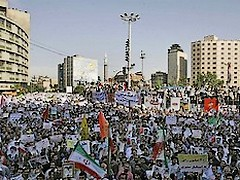 A large percentage of Iranians support the authoritarian rule of Ayatollah Ali Khamenei and the fundamentalist councils that exercise control over the elected officials. It is therefore quite possible that Mahmoud Ahmadinejad actually did win the election, albeit by a much closer margin than was officially reported. If I were betting, that’s where I’d place my money. It’s also irrelevant that Ahmadinejad probably did win. The Iranian government’s blatant rigging of the election demonstrates its illegitimacy. Too harsh? No other word fits a government that rejects the people’s right to exercise control over it. Indeed, the very structure of Iran’s government, dominated as it is by an unassailable religious cadre, denies the Iranian people the essential right that Jefferson crystallized for posterity in his Declaration. This is the voice of the Iranian government and it does not deserve to rule. The government is not God. Ahmadinejad is not God, Khamenei is not God, nor, I dare say, are they of God. Islamic law exists to serve the people, as Ahmadinejad and Khamenei hold their positions to serve, not to rule. As Jefferson said, when a government and its laws become a hindrance to the people they are to be set aside. Moreover, the government is obligated, should it wish to retain its legitimacy, to step aside on request of the majority. Instead of doing so, however, Khamenei seems to be following the dictator’s handbook by importing foreign mercenaries to maim and murder the opposition in the streets, thus proving my point rather neatly, I think.